Born in Los Angeles and now based in Berlin, what made you decide to make the move? Peaches kidnapped me after one of her tours. She locked me in her studio and told me to produce. Once I was there I was introduced to the world of experimental electronic music. I evolved from an engineer to a producer in Berlin, mainly because Peaches forced me to go into her studio and just play with her analog machines and scream at the top of my lungs to get me out of my comfort zone. She also taught me to be independent and use my technical background so that I was not dependent on anyone to put out my music. That evolved my work greatly. I originally did not intend on staying in Berlin, but once I was in that sort of creative space, how could I leave? What is the best thing about Berlin and Los Angeles? Berlin has a very special relationship with experimental music. It is not a hyped sort of environment but exists for its own sake and the influencers in town are very supportive in the community of the hybrid underground. There is a club in Berlin called Berghain that has one of the best sound systems in the world that is custom built for the room. They play genre-bending music you won't hear anywhere else in the world. It is this massive post-apocalyptic concrete world where anything goes and everyone is accepted. The day after I went for the first time I felt like I survived an apocalypse. Loud noises freaked me out. These sort of places could only exist in Berlin. Los Angeles is a hub that attracts the best art from all over the world. I am not sure why but everything is there or will be there at some point. How does LA's music culture differ from Berlin's? In LA you get to hear the best music and art in the world. Anything that is on an international scale is going to pass through LA. It is great because you never have to travel far to hear your favourite artists. They will just pass through. Berlin’s music culture is less filtered and selected. You get to discover things that are at their inception, fresh out of the womb and covered in embryonic fluid. How do you feel Berlin has influenced your work/style as an artist? It is mainly in the people I have met and how their work has rubbed off on mine. I meet all sorts of amazing artists in Berlin, my best friend in Berlin for example, named Nadine, is this brilliant engineer and producer. I met her at a show where she performed with and programmed a robotic drummer in this audio visual performance/ concert. Berlin is a special place for creatives. It is probably why David Bowie was drawn here. Berlin has a unique history and open artistic culture that pours over into the streets (often literally) and it rubs off on the artists creating here. In Berlin I met artists that like to pull apart things and see how they work physically and metaphorically. Consequently, I started taking apart some of the gear and instruments I use which led to me getting into do it yourself mechanical engineering, computers, aurdino, building LED rigs, etc., There are no rules in Berlin. Straight is boring. What do Berlin and Los Angeles sound like to you? Berlin sounds like gossamer wings. Los Angeles sounds like vertigo. Why do you think Berlin and Los Angeles are known as two of the most accepting cities? Berlin is like a genderless being changing the world by its mere existence. Los Angeles is like a powerful woman excelling in a man’s world. To honor the 50th Anniversary of Berlin and Los Angeles being sister cities, you performed at Berlin Lab in Los Angeles this October. How do you feel about being a part of an event that celebrates the long standing relationship between the two cities? Simonne Jones was born in Hollywood, California, but established herself in the experimentally charged atmosphere of Berlin. 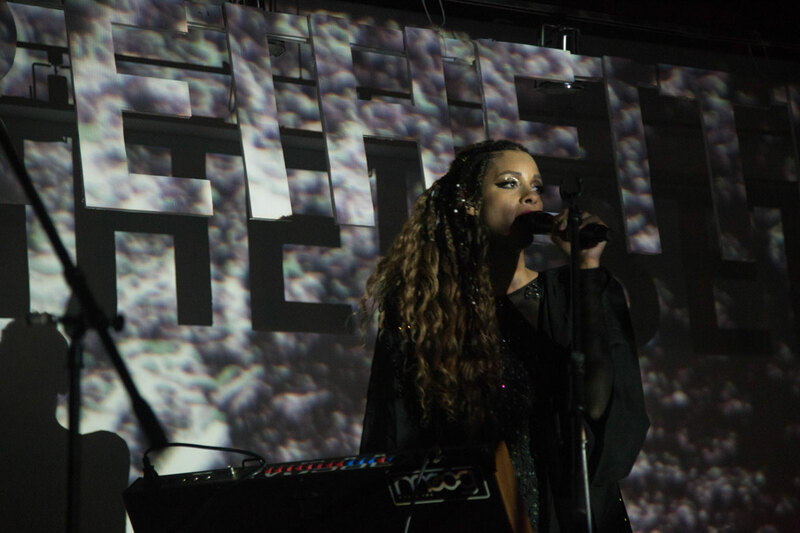 She is a multi-instrumentalist creating introspective electro pop that pushes the boundaries of a few genres. Her scientific background is a touchstone in her creative process. Her tracks create an intersection of science and the arts yet is grounded in human experience. Jones in love with the universe.